Catalog instructions and skins ( hpprime (simulated) ) in n languages. / Catalog instructions and skins ( hpprime (simulated) ) in n languages. Your ti68k calculator can now help you translate languages. RE: Catalog instructions in n languages. The HP Prime already does support multiple languages. As for commands, pressing the Help key will provide the actual documentation (in the proper language) for that command. 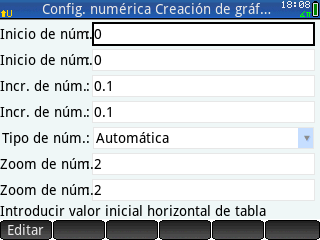 The HP PRIME GRAPHING CALCULATOR (Software Version: 2015 6 17 (8151), CAS Version: 1.1.2-11, Operating System: V0.037.526), too have helps, in various languages, as ... (see, image, from Android Emulator). You needed, press Shift Home, and go to Language (in you have, configurated English) and change, if necessary. RE: Catalog instructions and skins ( hpprime (simulated) ) in n languages. You have reason, but what, is the problem ?. However, is very easy, equal, for the operation's. HP, is invent !. Are created, for other's, more important's achievements. In other words, or you stay at HP, or you can migrate, if you are, not convinced. There are multiple problems with translation of language keywords, which is why it really is not done anywhere with regularity for any math/science/programming language or text. 1. Like it or not, english is the defacto language for math/science/programming at the moment. 2. Instead of now having ~1000 commands, you've now created 8000 or more. This means that the chances for collisions with reserved commands has gone way, way up. It makes writing user programs, and SHARING them much more difficult. 3. It makes it much more difficult to find help for the functions. You can no longer search "HP PRIME CHOOSE" and get help on the internet. Don't happen to have much localize help from others about that in your language? Too bad. You won't find it due to the "helpful" keyword translation. 4. Since no serious calculator has on-screen keyboards (classpad doesn't count, they are specifically banned most places due to this), optimizing for each language is essentially impossible. It makes it really, really bad to use for some languages. Things aren't ideal now, so why make it even worse? Basically, though. It seems like it would be a good idea, but in reality isn't for these and several other reasons. I totally agree, also I don't see very useful if the commands are translated, and indeed, I think that would complicate my life. For example I hate the Spanish version of AutoCAD because the commands are different compared to those used in English, and the learning curve becomes even steeper and slower to go over. Soluc.? Explor.? please just made up new terms instead. Beauty itself. Jony Ive would be jealous. It is pretty much a real life representation of the result of the Chinese room experiment, but now with a Spanish dictionary. Now: try to wonder THIS current state, spread not only to aesthetic stuff but functional things. The calculator would barely 'turn on' because internally it would call some getExcited() syscall. I agree with mandresve and eried! I'm an Spanish speaker and I don't like Spanish versions of anything in my computer even the OS. Some things must remain just as they were originally created, I'm not a fan of translations. The first multilingual thing I owned was TI92+, the Geometry-part was made to work in German, too. I tried that for not more than 5-10 minutes and then switched to English and never tried German on another calc. Sometimes I even am confused when I use Geogebra and must use German commands because my pupils do. At least at the moment English is the language to use, imho other languages can be omitted and freed memory has some better use. (04-16-2016 10:27 PM)Arno K Wrote: imho other languages can be omitted and freed memory has some better use. Well, I agree that issue occurs in translation, maybe some language have more issue than other. but I would not like they remove translation to free memory. My daughter does not use hpprime in english, and it's very nice for her. Also I often switch to french, it's not that bad. The mathematical packages translated into other languages, are very bad, because they are made by people who do not have extensive knowledge in mathematics. As hpprime is an educational product, I insist that should be given the option of programming in native language (spanish, french, etc). I have never been a fan of translated commands into different languages. It is still a mistery the reason why excel commands are language based. Anyway speaking about hp calculators and from a marketing point of view the only thing i would do is to have both the pdf and onboard manual in many languages. The lack of manual in languages like italian prevent parents from buying a calc they couldn't explain to their 'kids' and scare students in case they are not able to fully understand the instruction. If i buy a usb wall plug i don't mind about the language of the manual. A complex calculator for foreign students is even more difficult to understand if the manual has not been translated. We are all conscious that english is the refence 'language' but in some countries english courses and math don't match in that way. Then i understand that translating a manual in every la guage is a (huge) cost. (04-17-2016 01:15 PM)compsystems Wrote: The mathematical packages translated into other languages, are very bad, because they are made by people who do not have extensive knowledge in mathematics. Exactly. Translations are always done at the lowest bid (just like pretty much everything else with modern business unfortunately...). In our case, HP has a process the whole company uses, and we need to use it. What if there was a tool packaged along with the connectivity kit that made it so interested users could modify and adjust the built in translations, share them, create new languages, etc? I'll start another thread discussing this. IMHO, what, I started, with ... HP67/HP41CV/HP28C/HP75C/HP48G+/HP49G/HP50G/HP PRIME GRAPHING CALCULATOR, never haven't problem's, with the interpretation, of commands and function's, for learn and use, in English Language, the Guides and helps.